I am always looking for new ways to serve "cavolo nero" - a leafy vegetable that is very popular in Tuscany, it is in the kale family.Right now, it is in season and very reasonable - I get about 2 lbs for $1.50. It is very good for you. Today, I decided to try fixing it with gnocchi - it came delicious! I jut boiled it in a small amount of water (do not drain the cooking water, I used it to cook my gnocchi), chopped and seasoned it with salt, pepper, garlic and extra virgin olive oil. Then I made gnocchi (my recipe is very easy - 4 parts potato, 1 part white flour - no eggs). I used about 1 lb of potatoes, weight raw. So I added about 1 cup of flour. 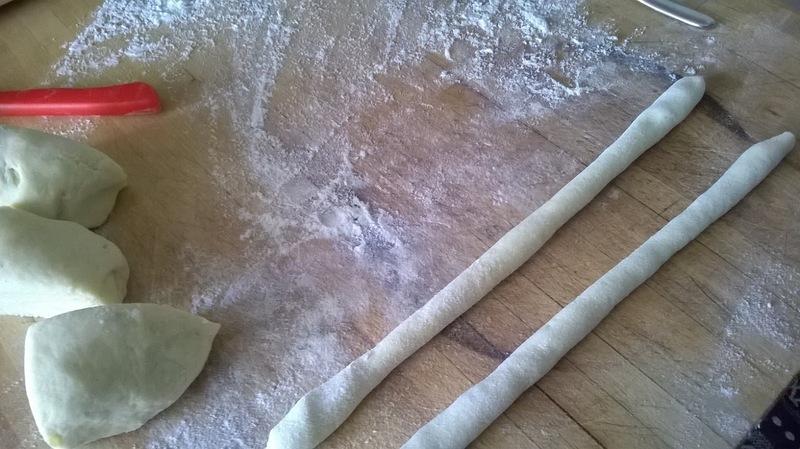 The dough should not stick to your fingers but should be soft. 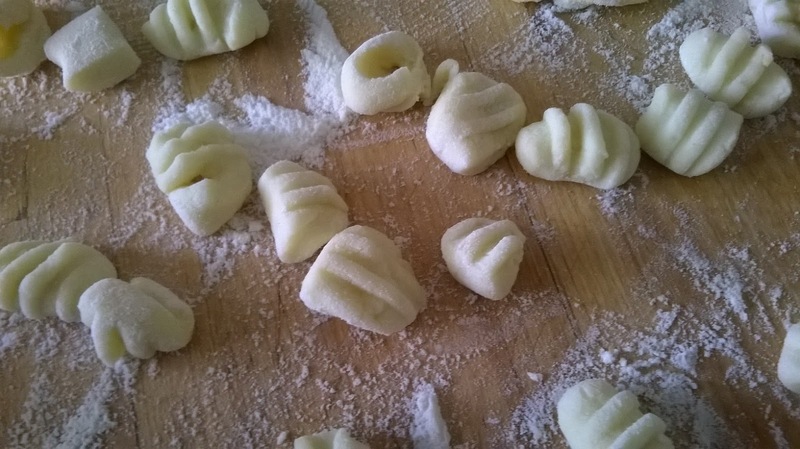 Do not add too much additional flour or your gnocchi will be heavy. Here's is the procedure: boil the taters in their jackets, when they are cooked (poke them with a fork which should easily pierce the potato but not split it open), cool slightly, peel and mash. You can use a potato ricer, but I just used a fork to mash them well. 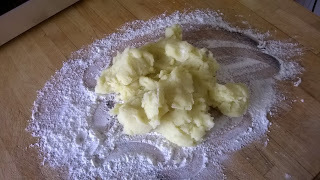 Then add the flour a little at a time, using your hands to mix it in after each addition. Once you have added all of the flour, knead the dough lightly. It should be soft but not sticky. At this point wash your hands and dry them well. Dust your hands and the cutting board with flour. Roll out into cylinders about the diameter of your index finger. Cut into 1/2" pieces. You can stop here - but if you want to get fancy, hold a fork with the tines down and touching your work surface and the back of the tines facing outwards. Now pick up a gnocco, and with your index finger, gently press it against the backs of the tines and roll it down and off the fork onto the surface. This will give you the classic gnocco with a concave inside and nice ridges on the outside to "grab" the sauce or condiment! To cook the gnocchi, bring a large pot of water to a boil (I added more water to the water drained from the cooked greens). 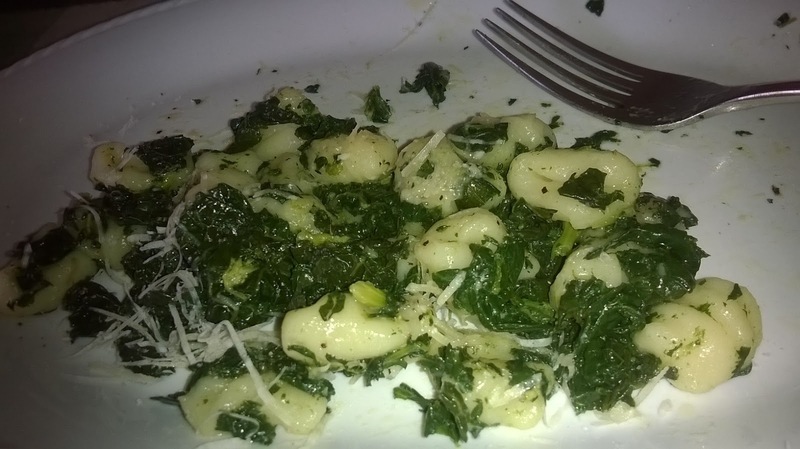 Drop the gnocchi in a few at a time. By the time you have added all of the gnocchi, they will start floating to the surface, this means they are cooked. Do not overcook or they may break up. I do not drain them in a colander because they are very tender and delicate. Instead, remove them a few at a time with a slotted spoon as they float to the top and transfer them to a large non-stick frying pan with the seasoned chopped greens. 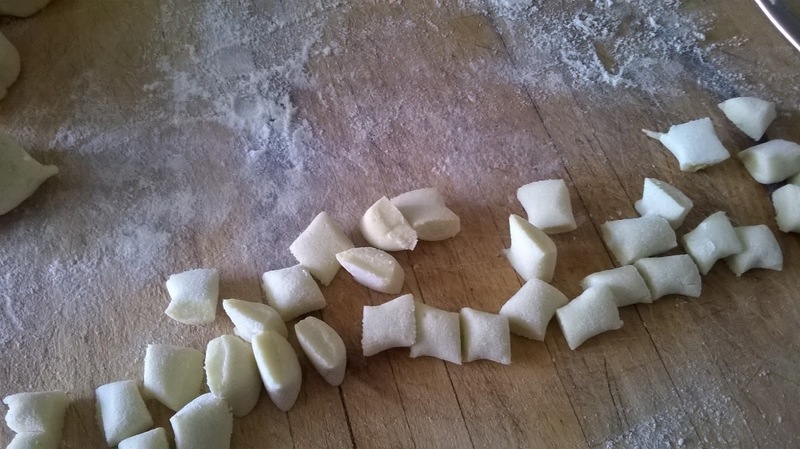 When all the gnocchi are cooked and have been transferred to the pan, toss delicately (these gnocchi are very tender and very light, so be gentle!) to coat with condiment. Serve with freshly grated parmigiano cheese and freshly ground pepper. Buon appetito! !